How to Build a Large Online Furniture Store? More and more people are shopping online for clothes, food, toys and even furniture. A decade ago people would buy furniture, like a sofa or a bed, only after seeing and feeling it. You want to “test” the product before your buy. If you are buying a bed, you lie down on it. If you are buying a sofa you sit on it. This is the best way to check for comfort and quality. But even with this caveat, online furniture stores are increasing and has become a lucrative business. Starting a furniture store is a lucrative business. Building one online store is an even better business opportunity. To get an idea on the profitability of an online furniture store, let’s check the current market statistic of this business niche. In the United States, the projected 2018 revenue of the furniture business is around $304.3 billion. Data shows it will only get better in 2019. The furniture market will grow annually by 0.2% from 2018 to 2021. You might scoff and say that an 0.2% annual growth rate is too small. The furniture business already has gigantic base of $304.3 billion. A “small” growth of 0.2% translates to $60 billion of additional revenue every year. Developing an eCommerce furniture website can let you have a slice of this very profitable business. Below are some of the benefits of having a website to sell furniture online vs selling at a brick and mortar store. A physical store can only market to customers within range of their location. A well established neighborhood store can operate for years. But these stores will remain small because of their inability to scale and offer their products to a wider audience. Opening a furniture store online will allow you to scale your business to heights rarely achieved by physical stores. Physical stores are rarely open 24/7. With the exception of convenience stores like 7-11, stores open from morning until early or late evening. Sometimes they close shop on Sundays and open only for a few hours on Saturdays. This is not the case for online stores which can operate for 24 hours everyday including Sundays. Your online furniture store can service thousands of customers. These virtual shoppers can be assisted by only one or two store managers. A physical store’s operational expense is larger due to a bigger employee payroll. These personnel will also need paper towels, computers, locker rooms, and other utilities further increasing expenses. An online store can sell almost a limitless amount of items. You can create hundreds of new display rooms or showcase a new furniture with a few clicks. A physical store would need to expand their property in order to add the same amount of products. Online shoppers can send messages, reviews and feedback which can help you improve customer experience. Leverage surveys to find customer needs and wants. For example, home furnishing ecommerce sites use surveys to “predict” what furniture color will sell more, thus they can avail of more stock. An online furniture store can utilize a lot of tools and strategies to increase revenue. When a customer visits your website, offer discount vouchers in exchange for their email address. Use email to send campaigns and brochures to entice purchase. Up-sell by “recommending” other items that were bought by customers buying the same product. Highlighting a product is also easier using website banners and marketing ads. The online buyer is able to choose from multiple payment portals. They can use their credit card, but let us say it was expired. They can use PayPal. No PayPal account? How about direct bank payments? For the online store owner, online payments make it easier to account for sales. No more auditing end of day sales, counting of cash then depositing to bank. Here are the basic steps to building your own online furniture store. The functionalities and features discussed below are enough for you to start a profitable online store. Magento is the leading eCommerce software platform used by numerous online stores. It is a scalable solution with useful out of the box functionalities like payment portals, easy to use admin panel and drag and drop layouts. It also enhances your website loading speed which improves customer experience and conversion rates. Magento has hundreds of ready made themes that are customized for certain niches, like shoes or clothes. Choose one that best fits a furniture store. Get a theme that is responsive and works on any device screen. It should have localization for major languages. It is important for theme developers to provide complete documentation from installation to operation. Look through theme catalogues. On Themeforest.net and other online catalogues, you can choose a theme by the website category. Keep in mind, however, that ready-to-go website themes are limited in functionality and may require heavy changes in the future. Order a custom theme. Ordering a custom design is another way to make your online furniture store stand out. Unlike a template, a custom design excels at functionality and can be modified anytime to tailor the needs of your business. You can order a fully manageable custom website design simply by contacting us at Newizze. Magento 2 supports a variety of shipping methods which sets your warehouse location, delivery charges and placing of delivery address. Magento 2 supports all popular payment gateways making it possible to sell your product worldwide. Most payment methods are available “out-of-the-box” and includes PayPal for Worldwide payments, Braintree for North American clients and Paybox for European clients. With PayPal’s deep integration with Magento, you can easily accept credit cards and PayPal payments using PayPal, all while keeping customers on your site. A smooth experience must be delivered from the moment a customer purchases an order to its delivery and acceptance. You must choose a trusted logistics partner to handle courier services and delivery. A failed or bad delivery will cause negative feedback that can spread and damage your reputation. What is important for customers when choosing a delivery company? A huge part of Americans have voted in the favor of delivery to their doorsteps. Real-time package tracking has a major effect on choosing a delivery company. Nearly 90% of respondents have noted the importance of tracking when it comes to the drop off delivery. You must have a system to transfer product data to your online store. This can be done manually, but if you have a few hundred products, it will take a lot of work. Data for all your products can be imported into your online store using Magento 2. Import and export CSV data for the following categories: products, advanced pricing, customer main files, and addresses. Set up the import behavior – you can either update the current file, replace the data with a newer version, or delete the entity altogether. Data pricing can prove useful in updating the price list or the product range; you can also benefit from the ability to collect customer insights for your furniture store marketing strategy. Magento marketing extensions are ready made modules which you can install to personalize your online furniture store. 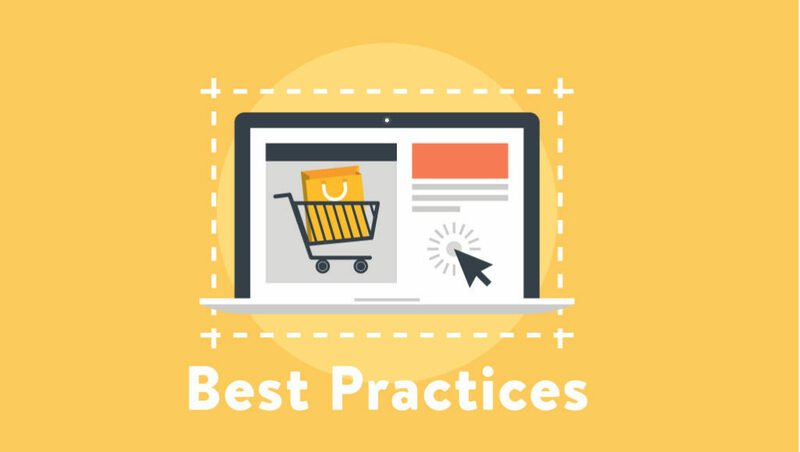 Popular ones are marketing extensions for incentivising product reviewers, and recovery options for abandoned carts. There are so many to choose from, and the list of must-haves for each store is ultimately an individual choice. However, we want to touch on a few business owners’ favorites. RMA is considered, by many, a must-have when it comes to marketing extensions for an online furniture store. It’s a tool created to make return management and the exchange of goods as easy as possible. RMA is available for Magento 2. Google Tag Manager is widely used among business owners (those that have furniture stores included) to improve the website performance. A web page that has a lot of images and links on it might not be easy to load – that’s where Google Tag Manager comes in handy. The Google Tag Manager extension is available for Magento 2. In order to get started, you’ll need to have a Google Tag ID. After setting up your Magento online store it is best to do some tweaking to maximize Search Engine Optimization (SEO). Simple things like manually editing automatically generated headers can help improve SEO performance. Optimizing each page’s URL, page titles and product descriptions will also help your site appear in more searches. Magento offers an out of the box capability to do A/B testing. You can use this feature to test variants of a product page to see which one resonates more to customers. This can also be used in conjunction with Google Analytics to check for bounce rate, page views, etc. Product descriptions with as much details as possible. Important information that must be present are colors, furniture size and weight, materials used, model name, furniture use, delivery time, place of origin, and warranty. High quality product photos with zoom option and a 360 degree view. Visual presentation is very important when buying physical products. Online assistance either from live chat with a salesperson or a chatbot. You can also provide a more premium service using live video chat to show the actual products from your showroom. A gallery that shows actual customers and their purchased product along with reviews. This killer feature will allow you to kill two birds with one stone. Potential buyers will be able to see actual photos of furniture and how it looks in a home or office scenario. You can also implement a reward system to motivate people to send photos of their furniture and to give positive reviews. The reward can be a discount coupon which can be an additional motivation to buy more products. Easier checkout. Registering an account in order to add items to the cart is a serious drawback for many online shoppers. Modern technology allows you to automate the registration at the online store. At Newizze, we’ve created a module that assigns an account to any first-time user. If the order is made, it gets assigned to this very account. It makes the checkout faster and less messy. Delivery estimates. It is always convenient to know when your next piece of furniture will arrive, especially if you’re moving into a new house or looking for a present for someone. We’ve created a module that’s able to calculate the estimated delivery date to provide businesses a new way to make sure their customers are satisfied. Moreover, if a user is not happy with the estimate, they can change a delivery address and the date will be re-calculated. A suggested delivery address. Filling in the delivery form is a huge turning point for many customers – it takes time and gives them a chance to reconsider the purchase. To make sure a buyer doesn’t bail on a deal, try to make the process of filling out the forms as easy and fast as possible. For example, at Newizze, we managed to create a module that registers the closest DHL to the user and suggests it as the place of delivery. This module has improved our clients’ conversion rates by huge numbers. Furny.com is a good example of a website where the module created by us was successfully implemented. Payments after delivery option. Every seller would love to receive payments as soon as possible. But implementing a Payment after Delivery Option can help you build customer trust. This dispel a buyer’s concern about losing money for buying a fraudulent item. FAQ page that can answer common “What If” questions. These can either be in a listed form or if you have a chatbot, the FAQs can be inputted into the bot’s database. The FAQs should be able to answer most questions, leaving only a few select questions to be answered by the help desk personnel. Adaptive website template design which makes your site viewable from any device, be it mobile or desktop. Coupon fields for discount vouchers. These empty fields can be placed near the checkout or total price, making it easy for buyers to find. Another strategy is to place them on the side or partially hidden. This will prevent buyers without vouchers to leave your sales page in search of discounts. Okay, we know what you’re thinking. There’s a LOT of eCommerce furniture websites. How can I create an online furniture store of my own? If you have plans of opening a furniture store online, it will take a lot of learning. But, really, why sweat it out when you can focus your attention to growing the business. Leave the website creation to the experts. At Newizze we are ready to share our experience with you. First of all, the most common mistake of online furniture store owners is trying to manage all website content manually. It works perfectly when you add a new article or adjust home page design with Magento 2 CMS blocks, but it’s really not an option for catalog management. Use CSV spreadsheets, data feeds and import your products names, descriptions and images easily in a couple of clicks. Now you have more time to spend with your love ones. Remember, things don’t always go as expected. Logistic companies can accidentally damage your product during delivery or the product may be found to be defective. Anything can happen! Use the return merchandise authorization (RMA) option to keep your reputation safe. This will also present you as a trustworthy seller and help increase customer loyalty. It is also a great strategy to use issue refunds when applicable, give coupons and free gifts — anything that fits your marketing strategy. And don’t forget one important thing, people are social creatures. The actions and opinions of previous buyers can be great influencers to your customers. 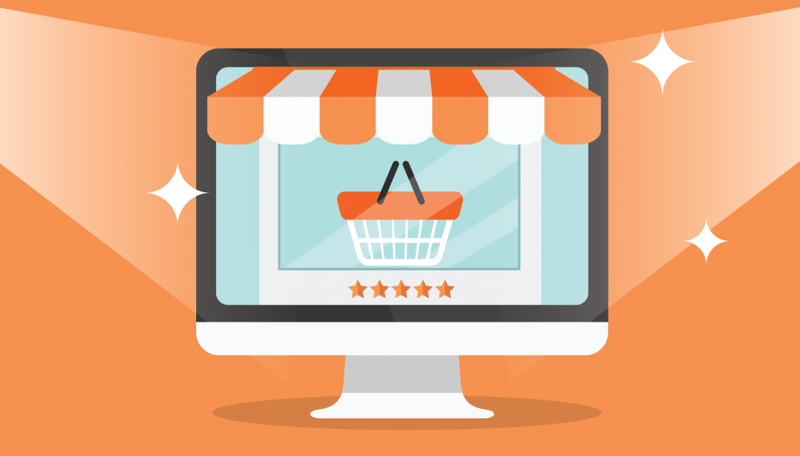 You can use a variety of Magento 2 features like highlighting the bestsellers, most viewed products, and posting customer reviews. This will build a community of active customers centered around your service. You can use campaigns and promotions to motivate people to give feedback to strengthen your company’s reputation. So, what is the cost to build an e-commerce furniture website? There are a lot of variables that affect the cost. The answer will rely on the amount of customization and requirements. Build cost may range from the simplest website costing around $3000 or less to more complex websites that cost $100,000 or more. Branding elements – designing custom pictures for the gallery, logo design, etc. If we are talking about Magento platform, a basic eCommerce website there may cost around $3,000. This includes basic Magento functionalities with a simple theme. A custom Magento eCommerce website made by professionals may cost around $5,000. This includes more functionalities like integration with other systems, a custom design, additional Magento extensions and custom fields. Creating a development strategy. We use Scrum to create a custom development strategy for a project. This involves breaking the development into stages – coding itself, design, QA testing, delivery, and maintenance. Design. This stage of development includes creating the sketches for UI and UX design, turning them into prototypes, and creating the final look-and-feel of the website. Programming. 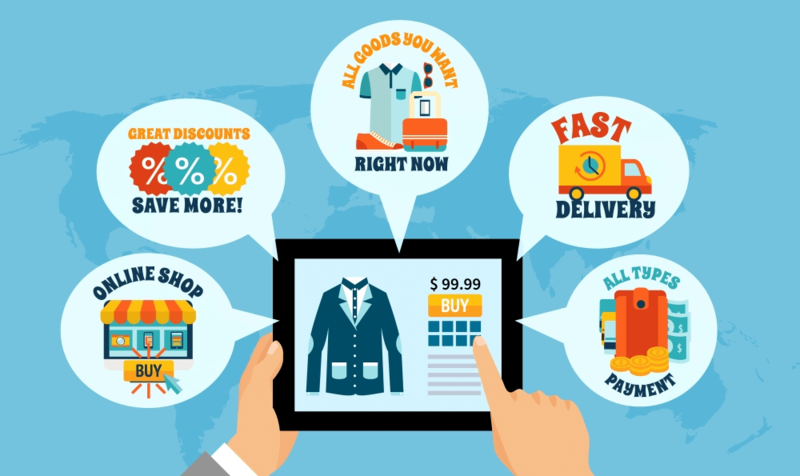 This involves building the front-end and back-end code of the website, the e-commerce tools integration, and connecting the website design to the e-commerce engine. QA testing. In order to ensure the project runs smoothly, our testers create glitch lists and eliminate bugs one by one. Once every two weeks, the website gets fully tested to access and eliminate new bugs. Project delivery includes the rollout of the website – at this stage, the final terms are agreed with the client to make sure the website has the smoothest transition possible from its older version. Maintenance. After the website is up and running, we keep in touch with the client to make sure all the tech is up-to-date and satisfies the needs of a client’s customers. A top of the line Magento Enterprise eCommerce store will cost around $10,000 to $20,000, sometimes even more. The premium cost will give you an almost self running online furniture store. All the tools needed for a great customer experience will be included. Other add ons are social media integration, SEO optimization and integration with logistic companies. 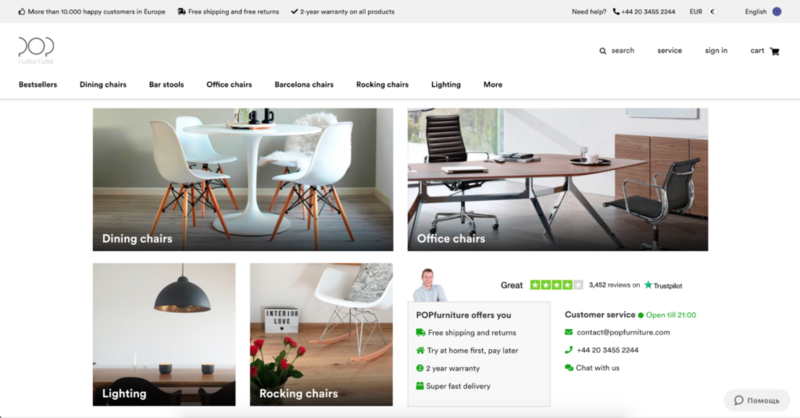 Here are two great examples of a Magento powered online furniture store. Furny.com is a great online store based in Europe. It has a multi-language feature to reach more market and a diverse selection of payment gateways. This website chooses to feature the bestselling products the home page. Popfurniture.com is another similarly built store. It also has a multi-language feature. It utilizes a popup promo to gather customer email addresses in exchange for a discount voucher. Both websites are responsive and viewable on any screen. Both utilizes a Chatbot help desk which can answer common questions. 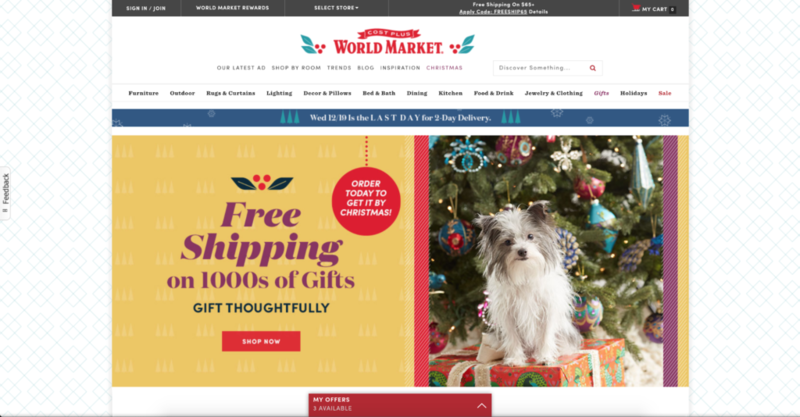 World Market is a furniture store from San Francisco. Founded in the 1950s, it later found its online presence – the store now has a stylish responsive website. One of World Market’s noteworthy features is the way it combines simplicity and elegance. On the one hand, the website structure isn’t overly complicated with design gimmicks – this enables fast page loading and easy navigation. On the other hand, the website looks nothing like the old sites from the 2000s, but rather has a modern look with a fine use of white space that connects text with images in a compelling way. Lex Mod is a classic example of a modern-day e-commerce store. Wide screen with a slider on the main page, a strong accent on company’s logo, and branding colors are all elements we’re no stranger to seeing. What makes Lex Mod compelling is the developers’ ability to add different features in a non-invasive way. For instance, there’s a live chat feature which isn’t presented with annoying pop-ups but can be easily accessed on-demand. The website does a great job of presenting the company’s advantages at first glance – free shipping, support service, etc. Lulu & Gerogia define their store as offering home decor for the style-obsessed. Even without reading the company’s motto, you’ll get the message by just looking at the website. 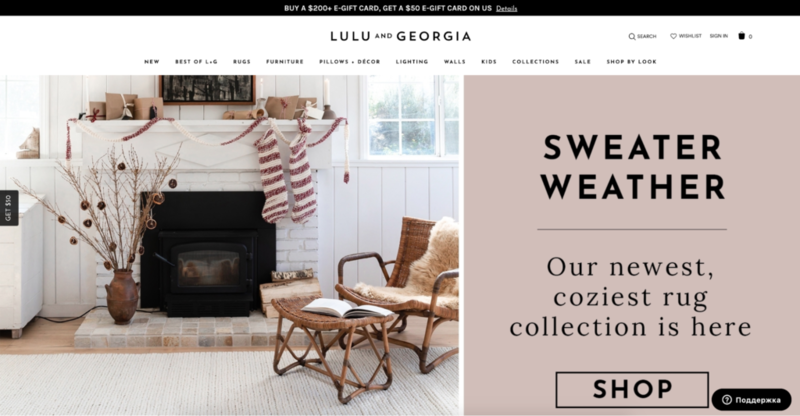 A smart choice of the website’s main color (in Lulu & Georgia’s case, it’s black, white, and pastel) and a loose, stylish, almost editorial-like layout leave you with the feeling of entering a luxury store. Online furniture store development takes effort and an investment in time and money. You can choose build an online furniture store using cheap and simple platforms. But put yourself in the shoes of the customer. Given a choice, would you buy a valuable furniture from a clunky online website? Like in the real world, a buyer would gravitate towards a well built and professionally designed online store instead of something unappealing and hastily made. Are you ready to do business? Contact us and let’s discuss how Newizze can help you with your eCommerce furniture website design.